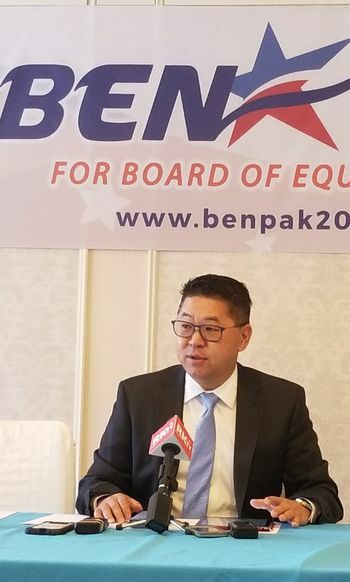 Ben Park, a 48-year-old aide for California Senate leader Kevin de Leon, has officially announced his plan to run for the board member position at the State Board of Equalization (BOE). The decision marks a shift in Park’s direction after he initially declared to run to represent the 38th Congressional District of California for the Hose of Representatives. Park said that he aims to right the ailing ship that is the BOE, which has recently suffered from various corruption cases, including embezzlement and nepotism. The Third District encompasses L.A., Torrance, and Glendale, all areas with populous Korean communities. Park plans to finish his work for the Kevin de Leon camp and begin campaigning for the BOE seat starting next week. Meanwhile, the BOE overseas tax collection, disputes, and mediation for 72 types of taxes. It collects over $60 billion in tax money alone. The BOE once employed about 4,800, but has been downsized considerably after a series of scandals recently.